125 painters, over 60,000 paintings, and a decade of blood, sweat, and tears went into Loving Vincent, the first film ever comprised entirely of oil paintings. That's right. You've seen how painstaking traditional hand-drawn animation can be, to say nothing of stop-motion animation. Well apply that to the immaculate detail and dedication required to produce just a single painting. The mind boggles at what writer/directors Dorota Kobiela and Hugh Welchman went through to get this film made, as an homage to the work of the great Vincent Van Gogh. We can only hope the attention it receives will justify their efforts, even if the story they chose to tell leaves much to be desired. Loving Vincent will almost certainly live a long life in museums and art classrooms, because truly there is nothing quite like it. 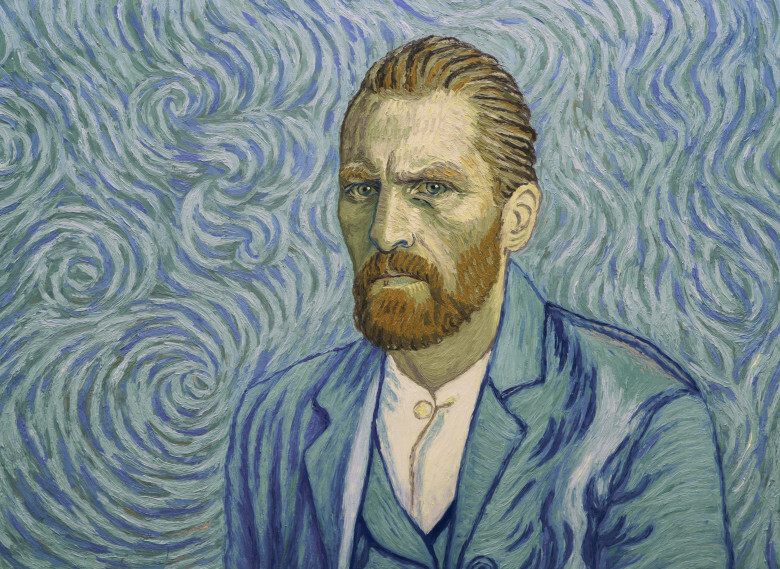 The film unfolds as a mystery/conspiracy theory around Van Gogh's death at the age of 37 in the year 1890, which was officially ruled a suicide but has enough unanswered questions to suggest foul play. About a year later, the postman Joseph Roulin (voiced by and portrayed by Chris O'Dowd), made famous as a fixture in Van Gogh's pieces, charges his son Armand (Douglas Booth) with delivering a letter to Vincent's brother, Theo. But when he discovers that Theo is also dead at this point, Armand sets out to uncover the truth behind Vincent's death by questioning the people in his life. There's real inventiveness in the use of Van Gogh's art, specifically the people in them, as guideposts to Armand's journey. He soon travels to Auvers-sur-Oise, where Van Gogh lived at the time of his death, to investigate exactly what happened. Van Gogh's depression was a well-known aspect of his life and he struggled with it, but at the time of his suicide it seemed to have let up. Could someone that he knew been responsible for what happened? He encounters Julian Tanguy (John Sessions), the art dealer who would be instrumental through much of his career, and of course the Gachet family; Dr. Gachet (Jerome Flynn) who would treat his depressive episodes, and daughter Marguerite (Saoirse Ronan), here extrapolated to be a possible love interest. Adeline Ravoux (Eleanor Tomlinson) is a theorist of her own and believes there is more to Van Gogh's death than there appears. Even the unnamed figure in Van Gogh's "Young Man with Cornflower" is given an expanded, and possibly pivotal role in the painter's fate. Breath-taking as the film is, often resembling Richard Linklater's Waking Life, the mystery itself is rather dry, and the film often feels like it's being ground like paint under the wheel. Many of the conversations go nowhere and like excuses to make as many of Van Gogh's paintings part of the story as possible. That can be appreciated from a purely educational standpoint, but it doesn't help the film move along any faster. And even animated like this, Booth is not an expressive or charismatic actor in the least. He sounds disinterested throughout, even when Armand begins to see that there was more to Van Gogh than slicing off his own ear and possibly killing himself. Loving Vincent is a gorgeous, inventive work of art, but some will take more value from it than others. They say that art is in the eye of the beholder, and that certainly applies here.